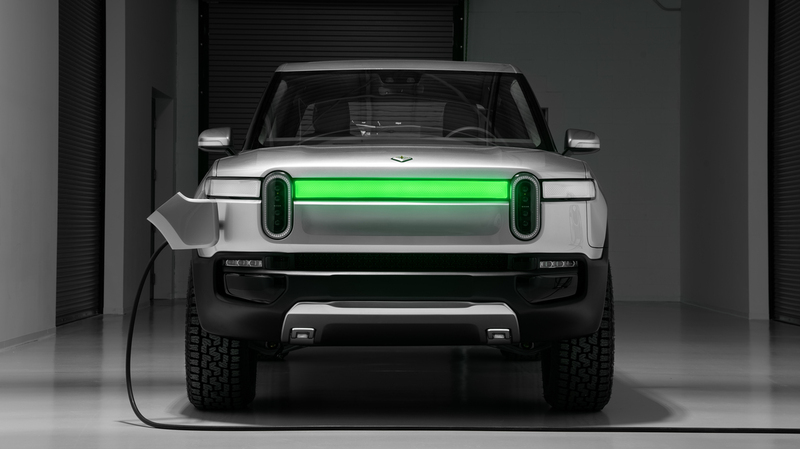 Electric Truck Startup Steps In Where Other Automakers Left Off Rivian plans to make battery-powered trucks and SUVs in a former auto plant in central Illinois. But it will face some challenges as Americans have been slow to adopt electric vehicles. Rivian, a startup, plans to make battery-powered trucks and SUVs in a former auto plant in central Illinois. Gas-powered pickups and SUVs now make up two-thirds of U.S. auto sales. But, until recently, truck buyers looking for an American-made electric-powered pickup would be out of luck. America's small electric vehicle fleet is just that — small, mostly cars and sedans. That's where a new startup automaker saw an opening. Rivian plans to make battery-powered trucks and SUVs in a former auto plant in central Illinois. It's the same plant where Wade Jensen's career began three decades ago, when Mitsubishi and Chrysler teamed up there to build cars. In the mid-'90s, they cranked out hundreds of thousands every year. But in 2015, Mitsubishi shut the auto plant down and moved production to Japan. Jensen and 1,200 others lost their jobs. Now, Jensen is back inside the plant as the engineering manager preparing for Rivian's first assembly line. The startup bought the plant in Normal, Ill., about 100 miles southwest of Chicago, and plans to hire 1,000 workers there in the next four years. The trucks will start around $70,000, and sales will begin for the trucks and SUVs in 2020. 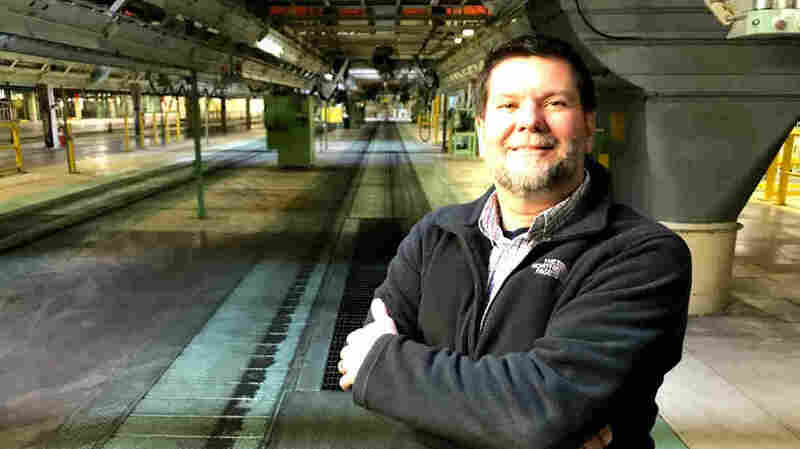 Wade Jensen is the engineering manager for Rivian's first general assembly line in Normal, Ill. Jensen worked at the plant's former occupant, Mitsubishi Motors North America. "When you've done it for 28 years ago, it's your passion. It's what's in your heart. It's your desire," said Jensen, 56, a father of three from Pontiac, Ill. "And to see the opportunity — to see this plant producing cars out the back door again, I was all in." The man who's recycling this plant and trying to make the first electric truck is Rivian founder and CEO R.J. Scaringe, a 36-year-old car geek with a Ph.D. from MIT in mechanical engineering. He started work on a gas-powered eco-sports car 10 years ago. But the auto world was changing: Uber was disrupting mobility, Google launched its self-driving car project, and another ambitious entrepreneur, Elon Musk, started bringing electric cars into the mainstream. "[Tesla] took the untruth that electric cars are boring and slow, and flipped that and showed the world that electric cars can be exciting and certainly very quick," Scaringe said. Musk is known for his bombast — tweets that move stock prices and promotions like shooting a car into space. Scaringe spent the past few years doing the opposite: staying quiet. Rivian hired auto industry veterans and raised a half-billion dollars from Saudi and Japanese conglomerates. It bought the former Mitsubishi manufacturing plant at a bargain price of $16 million. At the L.A. Auto Show in November, Rivian finally revealed its electric pickup and SUV with a charging range of 400 miles. "That's the opportunity we have, is to show the world that this is a space that badly needs electrification. Electrification can make those products better than what their gasoline and diesel counterparts had been in the past," Scaringe said. Rivian has about 600 employees so far. Design and engineering are done outside Detroit and in the U.K. Battery and self-driving technology development staff are based in California. And about 70 people are getting the Illinois plant ready for battery and vehicle production to begin in 2020. Normal, Ill., Mayor Chris Koos helped lure Rivian into that plant. His town of around 54,000 lost one of its top five largest employers when Mitsubishi closed. Koos said a big reason why elected officials in Normal offered Rivian millions in local and state tax breaks is because the new jobs will be high-tech. 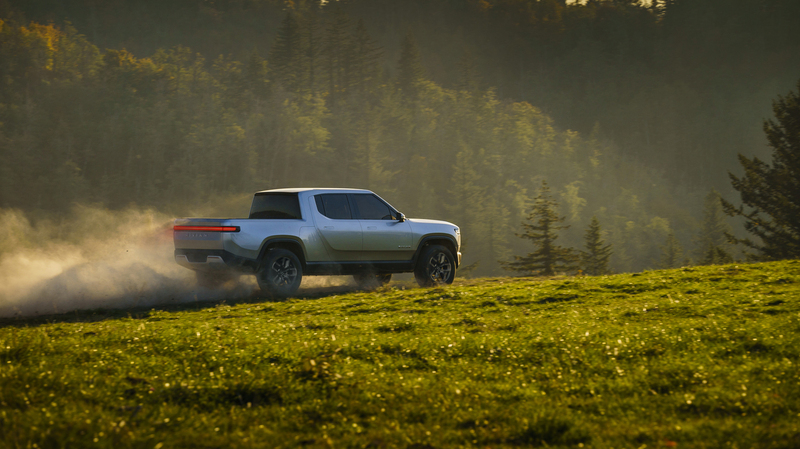 Sales begin in 2020 for Rivian's R1T pickup truck and a companion SUV. Both will be made in central Illinois. "The days of somebody running a punch press or a drill press — those days are gone," said Koos. "That's all automated. But the people that program that, and maintain that, and calibrate that, that's where the jobs are." Starting a car company from scratch isn't easy. Just ask Tesla. That company has hemorrhaged money, missed deadlines and freaked out investors. And it's considered a success. Other EV startups haven't even made it to market. One reason is that electric vehicles still represent a tiny part of the U.S. market — about 1 percent of sales. While they may be the future, low gas prices are a challenge to electric vehicles, especially for legacy automakers. If that changes in a few years, and Ford finally puts an electric version of its bestselling F-150 on the market, Rivian would be facing stiff competition. Electric vehicle industry watcher Chelsea Sexton saw Rivian's debut at the L.A. Auto Show. Startups have struggled to build dealership and service networks to sell and repair their vehicles, she said. For established automakers like Ford and GM, those networks already exist, and private mechanics are accustomed to working on those cars. "Engineering a good EV is not that hard, or at least it's not unheard of. Almost every single startup without fail underestimates the degree of challenge [in deployment], and the amount of time it takes," Sexton said. "We root for all the startups, but a lot happens between concept and showroom, and it's most vulnerable for the startups." Rivian's high price tag didn't scare off Ariel Fernandez from Florida. He was among the first to plop down $1,000 to preorder a Rivian SUV in November. Fernandez said he's concerned about the environment. And his Cuban immigrant grandfather taught him to buy American. Both led him to Rivian. "I'm willing to invest in this company and basically put my trust in them that they're gonna produce this vehicle and make me happy when I pick it up," Fernandez said. Fernandez's SUV will be made in Illinois. But that may not be the only product. Rivian also plans a side business selling its battery technology to other companies. So if electric trucks don't take off, maybe battery-powered tractors and Jet Skis will.